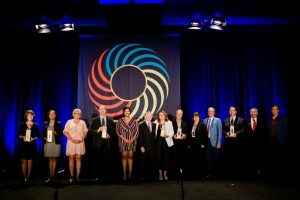 2018 ARTI Award winners – Courtesy of Arts Council of Indianapolis. Used with permission. When does news become old? Of course, that was my main concern as I was deciding whether to publish this story about “Start With Art,” presented by the Arts Council of Indianapolis. Indy’s preeminent arts event kicking off the fall arts season and major fundraiser for the ACI, the event took place on August 31 at the J.W. Marriott, and was attended by nearly 1,000 people. The delay in sharing this report was due to a number of causes, including a website crash, which set back the publishing of this blog post a few weeks. Finally, I decided that I simply had to share my impressions since I had some time to reflect on the impact the event had on me. After all, not only do I write about the arts, I am an artist myself, not to mention a producer and an administrator. My entire existence is wrapped up in the arts. It is my raison d’être. And as it turns out, this event reminded me of how intertwined my personal and professional life is and has always been with that of Indy’s artistic community and the ACI itself. Of course, I also wanted to write this story because interim Arts Council of Indianapolis Executive Director Shannon Linker found a place for me to be seated at the last minute after I reached out to her about wanting to cover the event. Luckily, I managed to land at a table next to my long-time friend Susan Zurbuchen, associate professor and chair of the Arts Administration department at Butler University, along with some of her undergraduate students. Prior to the start of the program and while lunch was served, I had the chance to chat with this dynamic group of young people, all of whom were from different parts of the country. I asked them about their studies and goals and they took interest in my own past experiences managing the Edyvean Repertory Theatre and Ballet Internationale and now Magic Thread Cabaret. Enhancing my enjoyment of being surrounded by such talent, I was also impressed by the number of Zurbuchen’s former students, many of whom are now arts administrators, who stopped by the table to greet her. It was obvious she is held in great regard by both her current students and those she has taught in the past. 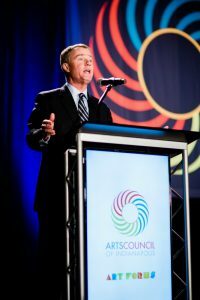 Mayor Joe Hogsett – Courtesy of Arts Council of Indianapolis Used with permission..
A highlight of the lunch for me was remarks given by Mayor Joe Hogsett. Having interviewed the mayor specifically about the arts for this blog earlier this year, I was especially taken by his comments because, for me, his interest in and support of the arts is more than just political expediency. He not only believes in their importance, but demonstrates his support by way of various grants, programs and awards his administration now offers and which he mentioned. They include the Create Indy grants, Cultural Division Awards and Music City. The most memorable of Hogsett’s words came at the end of his brief speech when he said, “You see, I hope to be thought of as an ‘arts mayor.’ Not for the adulation of artists or to see my name on a building or because I want Indianapolis to be hip or more famous. It is because, more than any other public or private effort we can muster, art transcends boundaries. It crosses divides. It brings us together. It unites us. My vision of Indianapolis as One City is built on a belief in shared humanity. Across zip codes. And I believe art is a manifestation of that humanity. And that is why. This. City. Supports. The. Arts.” Hogsett’s impassioned speech was a rallying cry for those assembled to remember just how important art and artist are, especially during this time of toxicity in our political discourse. I felt so many personal connections with the event, including the awards that were bestowed, starting with the Robert D. Beckmann, Jr. Emerging Artists Fellowships given to ceramicists Gary Gee and Jaclyn Head. Bob Beckmann, who was a founding board member of ACI, and I were also long-time friends, so I was thoroughly honored to be invited, along with several of his close friends, to advise the ACI on how to utilize funds he bequeathed to the organization after his death in 2001. I couldn’t help but think of how proud and gratified he would have been seeing these emerging artists recognized and benefiting financially from his generous gift. A successful businessman and philanthropist and community leader, Beckmann was also a gifted photographer and cabaret performer. Regularly holding fundraising parties and gatherings for arts organizations in his art-filled loft on Mass. Ave., Beckmann was one of Indy’s most popular hosts. For a variety of reasons, I was also especially interested in the 2018 ARTI awards that were given out, one being that I was a previous winner myself in 1991. I owned and operated The Alvarez Group, a video and film production company and because of my pro bono work for numerous arts organizations and participation on various arts boards and committees, I was awarded the ARTI in the small business category. It was an honor received during one of the most creative periods of my career and one which I still hold in very high esteem. No one is more deserving of winning the Volunteer/Patron ARTI than author, journalist, art collector and philanthropist Jane Fortune. I covered the Indianapolis City Ballet programs and annual “Evening with The Stars” annual galas she and her partner Robert Hesse supported until his death from cancer in 2016. I had interviewed them both and found them to be some of my most fascinating subjects I ever profiled. One of my most cherished memories is the personal tour I was given, by Fortune, of her museum-quality art collection in the home she and Hesse shared. My interest in the ARTI Artful Impact Awards given to The Cabaret, Phoenix Theatre and The District Theatre was informed by the history I share with all three of those recipients. I have written about The Cabaret since its inception at Chef Joseph’s at the Connoisseur Room to the Columbia Club to its temporary home at Indiana Landmarks and finally its now-permanent home on North Pennsylvania. Now, as managing director of Magic Thread Cabaret, no one appreciates the accomplishments of The Cabaret Artistic Director and CEO Shannon Forsell more than me for all she has done to put Indy on the map for the cabaret art form and expose Indiana audiences to the top talent in the world. A founding board member of Phoenix Theatre, I also performed in several shows there, so to have been involved from its sparse and humble beginnings to covering its shows over its entire 36-year history and now to witness its transition into a brand-new cultural center has been a profound and fulfilling experience. I also performed and reviewed shows at the former Theater on the Square and eventually produced a 2016 IndyFringe show, “Calder, The Musical: A Preview,” at the Mass Ave venue, so like many in the community, I was overjoyed that the theatre was taken over by the Central Indiana Community Foundation (CICF) and is now managed by IndyFringe. Beginning with Actors Theatre of Indiana’s successful production of “Forbidden Broadway,” the future looks bright for one of the very few theaters remaining in the city’s cultural district. Once again, I have a personal tie, considering that Magic Thread Cabaret is presenting an encore performance of “Katy Gentry: Judy Garland LIVE!” at The District Theatre Cabaret Dec. 7, 8, 9, 14, 15 & 16. 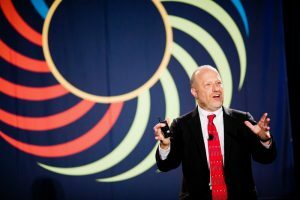 Randy Cohen – Courtesy of Arts Council of Indianapolis. Used with permission. Keynote speaker Randy Cohen, vice president of research and policy for Americans for the Arts, who spoke on the current economic impact of the arts on Indianapolis couldn’t have been more gregarious or energetic as he dashed from side to side on the stage, like a cheerleader for the arts he is. Preaching to the already-converted crowd of arts devotees assembled, hopefully his words sunk in to all the business and corporate representatives there who needed most to hear and respond favorably to his pitch advocating the arts as an economic driver. Hats off to the always innovative ACI for organizing and hosting what is believed to be the largest arts event of its kind in the entire country that brings the business and the arts communities together. Speaking as one who has written about, participated in and advocated for the arts for my entire career, those who are passionate about them should feel blessed that we have an organization in our midst that seeks to place the arts on an equal footing with sports, and hopefully someday (fingers crossed), secure more funding for them so that as a city we can truly call ourselves, world class.